Rule of Cuteness #10: If you haven't grown into your feet yet, it's cute. This bunnilicious photo of "Elliott" was found on Flickr, by a Heather W.
Oh my friggin' god. That is so cute it is unbeliveable. Even Einstein couldn't prove this bunny. Oh my Lord......that is major TOOTNESS!! Ya you heard me......I raised it a notch from COOTNESS to TOOTNESS!! Cute, but, it's #10 by my count. Awww, I remember when my bunny was that small. This site makes me happy when I'm otherwise way too stressed out. Thank you. I dont understand...words fail me. this is the kind of photo you can use in public! while walking behind a guy whose toenails were longer than my fingernails could ever be, i said to myself, "visualize cuteoverload... visualize cuteoverload." it works. one must check in with c'o daily to refresh the visuals as there are a lot of narsty things out there. bunnies are illegal in queensland. i'm in hayll! haha, I log on to check my daily cuteness posts and there's my friend's rabbit on the main page! Aaah! It's an bunny binky animation! Yaaaay! Thank you, EtanSivad! I think there should be another rule. This one would be something like: animals on their back that are small enough to be cupped in ones hands are extra cute. For reference, see the above bunny, the second picture of the leaf eating hamster, and chipdonkulous. What an adorable site! Tooooo cuuuuute! that silly bunny on sillybunny.ytmnd.com was so cute it actually slowed down my browswer. I like his smug little grin. It's like he's thinking "Yeah, I am that cute. Now watch me exploit you mercilessly... yeah, you know you'll like it." Or something. Looks like my dog when we rub his tummy - an expression of pure content. Well done. There are 2 websites that I am addicted to checking.. Cuteoverlord and Postsecret. You guys are unbelievable. I'm always at a loss for words, and am constantly laughing at my monitor. Bazillion 10q's. omg, that is teh CUTE. weddell seal pups and their too-big flippers. i just fell out of my chair from the preciousness. This bunny is v gorgeous and that dancing bunny vid was hilarious...that's one serious binkie going on there! that's one of the most beatiful things God gave us!!!!!!!!!!!!!! I really think that, per Nana B, you should rename the site Cuteoverlord. That has got to be one of the cutest bits of cuteness ever created by the God of Cuteness!!! that face just wants me to noogie-noogie-noogie at it. "That guy" (see previous comment) holding the bunny is actually my girlfriend. I took the picture by holding the camera above Elliot as if my girlfriend had another set of arms. Sweet lord. Cannot... take... the cuteness... The bunnies... the bunnies...! Sweet link, Brock. Love the site, you Overlords of Cuteness. Thanks for posting, Heather W.! You are properly credited now, and your photo link is GREAT! please send me one of these it is so cute. Luv the buni! I'm usually move of a hamstery person but that bunny is so cute!!!!!!!!!!!!!! This is the ultimate cutness!!!! It made me cry when I seen it!!!!!! P.S. I think my bun is jellous of it's good looks!!! This bunny is like a dream come true it is nearly the same size as my hamster!!!! This is very adorable, but I'm not convinced it's real. Real bunnies have pads for toes and I don't think they have fur inside their ears like this one. My blood pressure is through the roof!! .. CAN I TOUCH IT PLEASE? 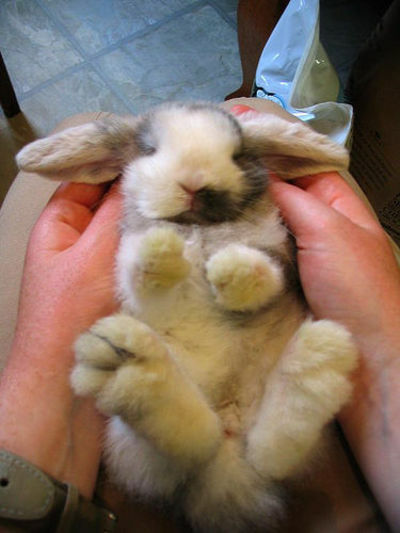 This is lyk the cutest rabbit EVER its lil feet r soo cute!!!! !